Our guys just hung the coolest fan! It's hard to see in the picture, but the fan is up inside that center grille. 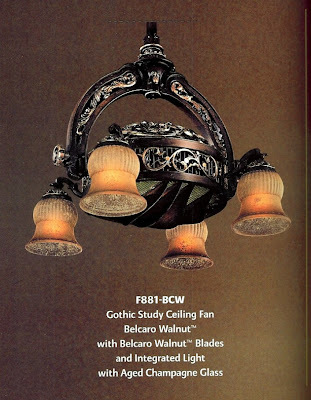 They call it "Gothic Study Ceiling Fan" ~ it's from their Hearst Castle Collection. As they say, "it is a magnificent rendition of times gone by". I could picture it not just in a study, but also over an eating area or in a living or family room. It's so unique!